1. Isolation of a new indoxyl alkaloid, Amoenamide B, from Aspergillus amoenus NRRL 35600: biosynthetic implications and correction of the structure of Speramide B. Tetrahedron Lett. 59 (48), 4236-4240 (2018). 2. 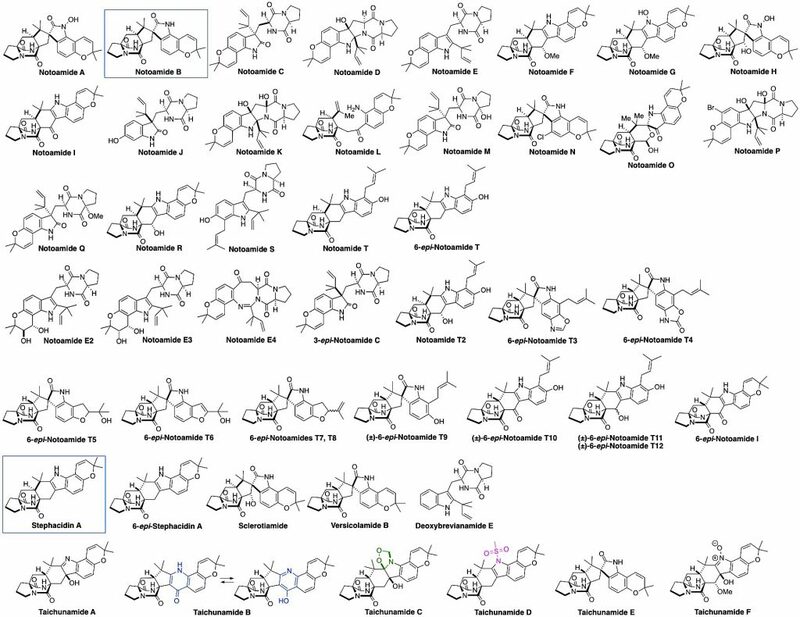 Structural and stereochemical diversity in prenylated indole alkaloids containing the bicyclo[2.2.2]diazaoctane ring system from marine and terrestrial fungi (Review). Nat. Prod. Rep. 35(6), 532-558 (2018). 3. Enantioselective inhibitory abilities of enantiomers of notoamides against RANKL-induced formation of multinuclear osteoclasts. Bioorg. Med. Chem. Lett. 27(22), 4975-4978 (2017). 4. Isolation of amoenamide A and five antipodal prenylated alkaloids from Aspergillus amoenus NRRL 35600. Tetrahedron Lett. 58 (29), 2797-2800 (2017). 5. Taichunamides: prenylated indole alkaloids from Aspergillus taichungensis (IBT 19404). Angew. Chem. Int. Ed. 55 (3), 1128-1132 (2016). 6. Natural Diels−Alderases: Elusive and irresistible (Perspective in The Journal of Organic Chemistry’s Special Issue “50 Years and Counting: The Woodward−Hoffmann Rules in the 21st Century”). J. Org. Chem. 80 (23), 11672-11685 (2015). 7. Comment on “Asymmetric syntheses of sceptrin and massadine and evidence for biosynthetic enantiodivergence“. Science (Technical Comment), 349 (6244), 149 (2015). 8. Isolation of notoamide S and enantiomeric 6-epi-stephacidin A from the fungus Aspergillus amoenus: Biogenetic implications. Org. Lett. 17 (3), 700-703 (2015). 9. Bioconversion of 6-epi-notoamide T produces metabolites of unprecedented structures in a marine-derived Aspergillus sp. Tetrahedron Lett. 56 (1), 247-251 (2015). 10. Synthesis and bioconversions of notoamide T: A biosynthetic precursor to stephacidin A and notoamide B. Org. Lett. 15 (1), 22-25 (2013). 11. Comparative analysis of the biosynthetic systems for fungal bicyclo[2.2.2]diazaoctane indole alkaloids: the (+)/(-)-notoamide, paraherquamide and malbrancheamide pathways. MedChemComm 3 (8), 987-996 (2012). 12. Study on the biosynthesis of the notoamides: Pinacol-type rearrangement of isoprenyl unit in deoxybrevianamide E and 6-hydroxydeoxybrevianamide E. Tetrahedron Lett. 52 (51), 6923-6926 (2011). 13. Biosynthetic studies of the notoamides: Isotopic synthesis of stephacidin A and incorporation into notoamide B and sclerotiamide. Org. Lett. 13 (15), 3802-3805 (2011). 14. Studies on the biosynthesis of the notoamides: Synthesis of an isotopomer of 6-hydroxydeoxybrevianamide E and biosynthetic incorporation into notoamide J. J. Org. Chem. 76 (15), 5954-5958 (2011). 15. Notoamide E: Biosynthetic incorporation into notoamides C and D in cultures of Aspergillus versicolor NRRL 35600. Tetrahedron Lett. 52 (16), 1987-1989 (2011). 16. Studies on the biosynthesis of the stephacidins and notoamides. Total synthesis of notoamide S. Heterocycles 82 (1), 461-472 (2010). 17. 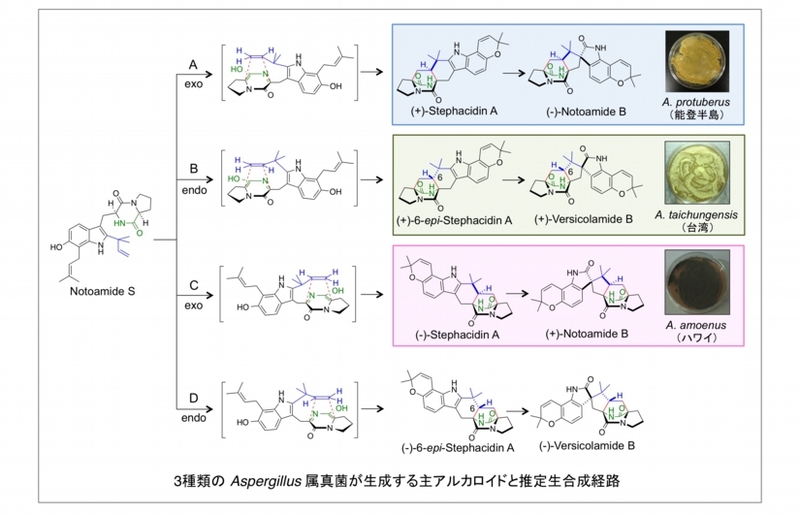 Genome-based characterization of two prenylation steps in the assembly of the stephacidin and notoamide anticancer agents in a marine-derived Aspergillus sp. J. Am. Chem. Soc. 132 (36), 12733-12740 (2010). 18. Notoamide O, a structurally unprecedented prenylated indole alkaloid, and notoamides P-R from a marine-derived fungus, Aspergillus sp. J. Nat. Prod. 73 (8), 1438-1440 (2010). 19. Asymmetric total syntheses of (+)- and (-)-versicolamide B and biosynthetic implications. Nat. Chem. 1 (1), 63-68 (2009). 20. Isolation of antipodal (-)-versicolamide B and notoamides L-N from a marine-derived Aspergillus sp. Org. Lett. 11 (6), 1297-1300 (2009). 21. Isolation of notoamides E, a key precursor in the biosynthesis of prenylated indole alkaloids in a marine-derived fungus, Aspergillus sp. J. Am. Chem. Soc. 131 (11), 3834-3835 (2009). 22. Notoamides F-K: prenylated indole alkaloids isolated from a marine-derived Aspergillus sp. J. Nat. Prod. 71 (12), 2064-2067 (2008). 23. 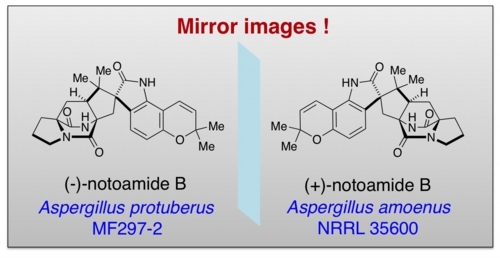 Notoamides A-D: new prenylated indole alkaloids isolated from a marine-derived fungus, Aspergillus sp. Angew. Chem. Int. Ed. 46 (13), 2254-2256 (2007). 24. A concise total synthesis of the notoamides C and D. Angew. Chem. Int. Ed. 46 (13), 2257-2261 (2007). 25. A concise, biomimetic total synthesis of stephacidin A and notoamide B. Angew. Chem. Int. Ed. 46 (13), 2262-2265 (2007).